I'd never heard of Tracy Bonham, but a quick Google search tells me she was fairly big in the late 90s, her single 'Mother Mother' went gold, and the album Burdens Of being Upright was nominated for a Grammy in 1996. So I give it a listen. Now, maybe I was too young to appreciate how good this sounded in '96, but today, it sounds like a crap Sheryl Crow. And when I think of all the great albums that came out that year; Nick Cave, Weezer, Stereolab, it makes it sound even worse. And then to read that it was bitter Canadian songstress Alanis Morissette that beat Bonham to the Grammy that year, well, I'm a little puzzled by the musical taste of the grown ups of 1996 to say the least. After the success of Burdens Of Being Upright, Tracy Bonham fell off most people's radar but received critical acclaim for her follow up albums and EPs. 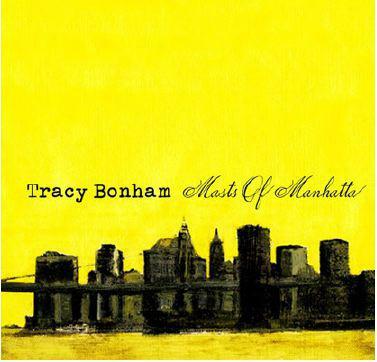 And now, after taking a small hiatus from music, Bonham is back with her first album in five years, Masts Of Manhatta. On this album Bonham is aided by Smokey's Roundup, led by guitarist Smokey Hormel, who's also worked with the likes of Tom Waits, Johnny Cash and Beck. Bonham herself also boasts an impressive list of collaborations: Areosmith, Carole King, members of The Eels and Led Zeppelin and er Ã¢â‚¬Â¦ Mandy Moore. So maybe Tracy has come along way since she lost a Grammy to Alanis and sounded like a second rate Sheryl Crow. Maybe not. Masts Of Manhatta is an entire album of songs that are desperately trying to sound like Tom Waits yet still come up stinking of Sheryl Crow. Tracy Bonham has lost the angst ridden rock chick vibe that was so popular in the 90s and has replaced it with the boring and bland observations of middle aged woman. The album, according to the press release, documents Bonham's struggle to adjust to living life in both the city and the country: "This is our life at the moment: the balance of the nature and the big city. Longing to be surrounded by nature, to get back a quiet and balanced life, but needing to be in the city as working people/artists." Says Bonham. This theme is directly approached in the song 'We Moved Our City to the Country' where Bonham so shrewdly observes our thoroughly modern need for mobile phones and internet; "They'll make friends with the local kids and LOL a lot/you can't go out until you've eaten all your sushi." If my mum were to write songs, they would probably sound exactly like this. This album is definitely not for me but I'm sure there will be lots of people who will love it - and they'll be the same people that loved Alanis Morissette in 1996. Every girl I knew in '96 LOVED Alanis, and I knew at least 2. This woman sounds like that frozen nineties man on South Park: they should keep her locked up with Ace of Base on loop so she doesn't have to go out and get confused by sushi and txtspeak.